The Real Buffalo Molar Necklace is made from a ranch-raised North American bison molar that comes from an animal that was killed for meat. 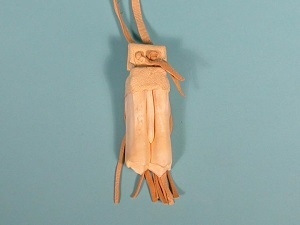 The molar has been cleaned, has deerskin fringe, and comes on a 32" neck strap. The size is impressive. One tooth we measured was 3.5" long and 1.25" wide.